Will Helenius be next for Vitali? By John F. McKenna (McJack): With former WBA heavyweight champion David Haye announcing his retirement and apparently out of the picture for the time being, who will Vitali Klitschko’s next opponent be? WBC heavyweight champion Klitschko (43-2, 40 KO’s) really wanted to defend his title against David Haye and that fight may still happen. Many boxing observers are not convinced that Haye’s retirement isn’t just a ploy to improve his bargaining position. “I’ll knock him out, I’ll smash his jaw. Vitali I’ll fight you if you are man enough. It doesn’t matter where I fight you, I’ll fight you on the moon. “He has my contact details, I’m waiting for him. No fight would generate more publicity than Haye against the old Klitschko. Now barely a month later Haye has switched gears and claims he is retired. Of course being retired is no big impediment to making a fight. All Haye would have to do is to say that he is coming back. Fighters do that all the time. Hellenius is improving with every fight. He has good punching power as he demonstrated in April when he KO’d Sam Peter and again in August when he TKO’d Sergei Liakhovich. A Klitschko – Hellenius fight would sell well in Europe and with both fighters being close to the same size and having good KO power it could be an interesting fight. Boxing fans are eager to see Vitali engage a fighter who is close to his own size. A Klitschko – Helenius fight would also demonstrate to boxing fans that Vitali does not win his fights just because he is the bigger fighter. Vitali is a pretty good chess player. If he were to express an interest in fighting Hellenius it would more than likely smoke out Haye. “Dr. Ironfist” is the only big money fight presently available to Haye and he may fear losing that opportunity if Vitali opts to fight Robert Hellenius. 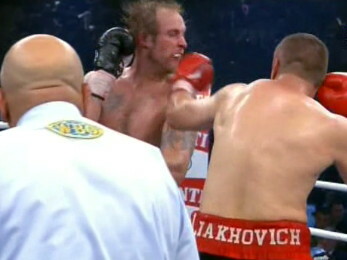 Boxing » Robert Helenius » Will Helenius be next for Vitali?